A Man In Colombia Got Cancer And It Came From A Tapeworm : Goats and Soda He came into the hospital in bad shape. In addition to being HIV-positive, he had what looked like a malignant tumor. The tumor, it turned out, was not human. 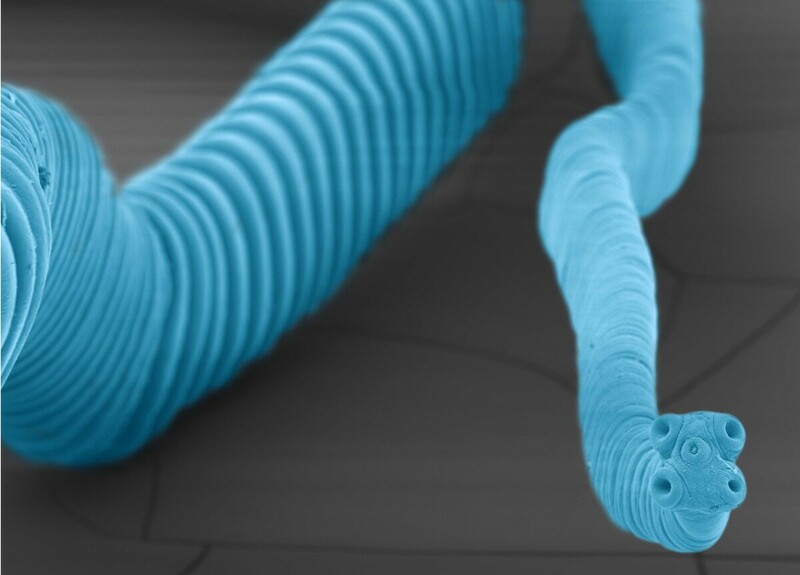 The dwarf tapeworm, or Hymenolepis nana, is the most common tapeworm in humans. It's 2 inches long at most. In January 2013, a 41-year-old man came to a hospital in Medellin, Colombia. He was in bad shape. He'd lost weight, had a fever, a tapeworm infestation and also had trouble breathing. He had HIV but had stopped taking his medications a few months before. It turned out to be a very strange medical case, published Wednesday in the New England Journal of Medicine. When doctors tried to find out why his breathing was labored, they came across what looked like tumors on his lungs, but the samples looked really weird. "It looked like cancer, but the tumors were composed of cells that were not human," says Dr. Atis Muehlenbachs, a pathologist at the Centers for Disease Control and Prevention and the lead author on the report. Doctors in Colombia had sent Muehlenbachs samples from the patient's lesions, which he says, looked like sheets and clumps of cells that were much smaller than human cells. At first, he thought it was a slime mold. Eventually — and, Muehlenbachs says, pretty much by accident — DNA tests confirmed the tumors were made of tapeworm cells. They had formed blobs on the man's lungs, liver and adrenal glands. Lymph nodes had swollen in the patient's neck to the size of golf balls, making it hard for him to move his head. "We knew invertebrates can grow tumors, but the fact that one can invade and disseminate in a human and make them sick just really, really defied belief," says Muehlenbachs. This video explains how the tapeworm is thought to have spread its cancer to a human. Peter Olson, a biologist at the Natural History Museum in London who took part in the research, says the dwarf tapeworm lives in the guts of some 75 million people. It's most common in areas with poor sanitation. "But it doesn't typically cause problems," he says. Of the about 9,000 described tapeworm species, the dwarf tapeworm is the only one that's known to be able to live and reproduce entirely in the human gut, producing new generations in the host's stool. "We think that was one of the things that allowed this to happen," says Olson, because "you can get a large buildup of parasites without having to be re-exposed from the environment." It sounds gross, though an otherwise healthy person with the tapeworm might not have any symptoms at all. But Olson has published on a couple of rare cases where, like this one, things went south. He says one was a patient with AIDS in California, and another was on immuno-suppressive drugs because he was receiving an organ transplant. Both died. In each case, the patients suffered from a double whammy: a tapeworm infestation and a downed immune system. "When your immune system gets compromised, you're in for all sorts of trouble," Olson says. In this case, he says, the worm multiplied in the man's weakened gut, each generation offering a new chance for mutations to crop up. Eventually, enough mutations must have accumulated, leading some larval stem cells to go awry. Instead of dividing rapidly to create a new, adult tapeworm, the cells proliferated as cancer. To find out what happened, the researchers compared normal tapeworm genes to those in the tumor, looking for spots where the cancerous ones differed. "There were structural abnormalities or breaks in a small number of genes," says Olson. "You can just think of those as broken genes." He says in three out of five of the cases, the "broken genes" were the same genes that get damaged in human cells, causing malignant human cancer. "It speaks of the commonality across the biological world," says Olson. "So, it shows that malignant transformation ... whether that's involving our own cells or those of a parasitic worm, may be the result of mutations to the same genes." If that happens and the patient's weak immune system can't contain the cells inside the gut, then the tapeworm cancer can spread in a human body. Muehlenbachs says that clinicians all over the world should be aware of this possibility. "We don't know how rare this disease is," he says. "It's the most common tapeworm worldwide, and HIV is also very common. So we're very eager to learn about other cases and potentially those that we might have an opportunity to attempt treatment." In this case, doctors never had a chance to treat the patient. For months, the hospitalized man had asked what was going on in his body, says Dr. Carlos Agudelo, an infectious disease doctor at the Bolivariana University in Clinic in Medellin. "He was very worried about his condition, and we didn't have answers for him," he says. The most Agudelo could do was show him the FedEx receipt to prove that they had sent his fresh tissue samples to the CDC for analysis. Days before the CDC figured out that it was tapeworm cancer, the man slipped into a coma. His kidneys were failing and, after almost six months in the hospital, he had refused further treatment. "When he was so sick and so tired, because he had spent several months at the hospital, he dropped all his hope," says Agudelo. Within 72 hours after the diagnosis came in, he died. "It was heartbreaking," says Muehlenbachs. He says it's unclear what treatment would help in future cases — chemotherapy for human cancer or antibiotics to fight tapeworm infections. "I'm afraid about the treatment that we can give a [future] patient if we discovered another," says Agudelo. He says if another doctor called him up for advice on a similar case, he wouldn't know what to say.